Wristwatch Fiction? A Novel Idea. If, like me, you enjoy a well written and presented watch portal, perhaps you should be aware of "The Mechanics of Style" from Girard-Perregaux. The site does not simply focus on the brand's collection, but offers a compendium of articles - global insights, luxury escapism, real people and real places - all are included. 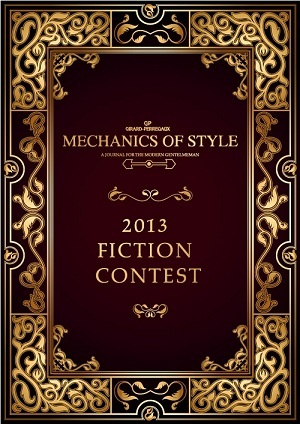 Although entitled "A Journal For The Modern Gentleman" it is even a feast for girly eyes such as mine and is a fine example of a very traditional company engaging with its fans using "new media".... which brings me to this, the Mechanics of Style 2013 Fiction Contest. Those with a penchant for the written word can submit a short story into which some literary product placement of a model from the Girard-Perregaux collection should be included. Six finalists will have their fiction published on the site, with a rather splendid Girard-Perregaux Three Gold Bridges Tourbillon fountain pen on offer for the winner ... now that's a novel idea. More details at the Mechanics of Style site here.